Everything here is top notch. You can go with the classic breakfast sandwich, bagel with flavored CC or even plain!... read moreEverything here is top notch. You can go with the classic breakfast sandwich, bagel with flavored CC or even plain! The bagels are a good size, nice and fresh always-little chewy on the outside and soft and doughy inside, never dried out. The owner is the MAN, always takes time to make you feel appreciated. Gotta love somebody who is doing a great business but doesn't take it for granted. I moved to Brick about 2 years ago and the thing I miss most is Bagel Boy! Luckily I will be back this Sunday-can't wait! Coming here for years and it's never ever change. Nice. hard working guys r there always trying to help. Never... read moreComing here for years and it's never ever change. Nice. hard working guys r there always trying to help. Never disappointed neither me or any friends of mine that I'm meeting here for cup of coffee and veggie wrap. Do u know what bagel boy have in common w/Mcdonald? It doesn't matter which McDonald u r going to step by at their French fries and burgers are always going to taste the same! So does Bagel Boy! Years ago when they were on Ocean Ave and Ave Y and Frank used to greet you with his sweet smile ( he is not there any longer btw) they were serving panini Capri that tasted just the same as it taste now. And their pee soup as well as tuna salad, white fish salad and cal slaw have the same old test that somehow always makes me happy just like at my grandma kitchen. 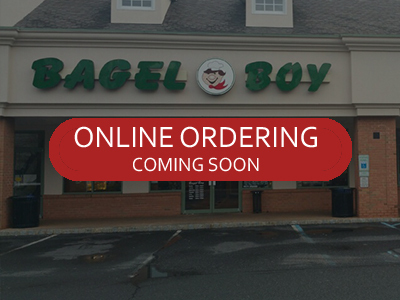 I have visited Bagel Boy several times and each time I have come away impressed with the quality of their... read moreI have visited Bagel Boy several times and each time I have come away impressed with the quality of their bagels and friendliness of their staff. Great bagels. Great variety. Nice people. We go all the time. I'll put up with surly cashiers for those two things. The whitefish is pretty strong, too. Consistently good bagels, sandwiches and coffee. I've never been disappointed with anything I got here, and that means a lot... read moreConsistently good bagels, sandwiches and coffee. I've never been disappointed with anything I got here, and that means a lot as bagel spots can be very hit or miss depending on the day and staff. Bagels are always fresh and they rarely run out of the staples like sesame or everything. They also do a killer lox, cream cheese and tomato here...their salmon is super fresh. Store made roast beef is killer too. Owner, James, gentleman; professional; rectified issues pertaining to series of unsatisfactory experiences per staff, retaining future business for location. Ugh what can I say about my beloved Bagel Boy? I moved out of state and now need to take... read moreUgh what can I say about my beloved Bagel Boy? Awesome food. Great service. Kelly, Bridget n staff excellence in creating customers loyalty. See you again... And again. Love this place. Superb bagels and service. They provide the Brooklyn hometown spice I miss. We appreciate your service. I've been coming to bagel boy consistently all my life because their bagels are one to beat. Their bagels are... read moreI've been coming to bagel boy consistently all my life because their bagels are one to beat. Their bagels are one of the best. They have a chewy outer texture with a soft middle which is literally the perfect bagel. Some of my favorite bagels are the blueberry and the whole wheat ones. They are also really thick rather than a thin bagel with a giant hole in the middle. You definitely gt a good amount of bread. They also have a wide variety of cream cheeses and spreads but one of my all time favorites is the vegetable cream cheese. There are chunks of different veggies that give it a lot of texture and flavors. This is my absolute favorite place to get a sandwich. Swift service, friendly atmosphere & a wide selection beyond sandwiches. Great bagel sandwich and coffee!! It's feels like a solid local place. Went on a Sunday morning so obviously it was... read moreGreat bagel sandwich and coffee!! It's feels like a solid local place. Bagel boy has my favorite everything bagel ever. If you're lucky you'll get Michelle. Michelle crafts the best bagels period. Get... read moreBagel boy has my favorite everything bagel ever. If you're lucky you'll get Michelle. Michelle crafts the best bagels period. Get an everything bagel scooped with cream cheese lox tomato avocado and a slice of provolone. Truly an excellent deli. I ended up going almost every day on my last NYC visit, and was more and... read moreTruly an excellent deli. I ended up going almost every day on my last NYC visit, and was more and more impressed each time. amazzzziing bagels! try the rainbow one! Bagel Boy is an icon of Bay Ridge. Everytime I have an out of state visitor I immediately bring them... read moreBagel Boy is an icon of Bay Ridge. Everytime I have an out of state visitor I immediately bring them to Bagel Boy so they know what a good bagel tastes like. I have been going to Bagel Boy since I have been a child. Their bagels are great, their coffee is that classic New York deli coffee which is better than Starbucks, and their chicken sandwich on a bagel is so good!!!! Really fast delivery, huge heroes- even threw in a big bag of bagel crisps at no charge. Definitely an exciting... read moreReally fast delivery, huge heroes- even threw in a big bag of bagel crisps at no charge. I was treated exceptionally well by the staff. The breakfast sandwiches are fantastic--I had an egg and muenster cheese on... read moreI was treated exceptionally well by the staff. The breakfast sandwiches are fantastic--I had an egg and muenster cheese on a roll with hot sauce. Impeccable. Thank you to James and Jessica for your warm welcome! Best coffee in the neighborhood, by far. They save me every morning, when i arrive like clockwork, to order my bacon... read moreBest coffee in the neighborhood, by far. They save me every morning, when i arrive like clockwork, to order my bacon egg & cheese on an everything bagel and my coffee. 1. Really good bagels! Soft on the inside and crunchy on the outside. Perfect balance. 2. Lots of spread options.... read more1. Really good bagels! Soft on the inside and crunchy on the outside. Perfect balance. 2. Lots of spread options. 3. Quick and efficient. Maybe five minutes in and out with a short line. My nieces and nephew were in town and wanted to try the infamous rainbow bagels! So i turned to yelp... read moreMy nieces and nephew were in town and wanted to try the infamous rainbow bagels! So i turned to yelp and bagel boy was the closest location to me that had it! We came in and got our rainbow bagels and blueberry bagel. I thought it was going to taste the same as ordinary bagels but just with food coloring, but, boy was i wrong! The bagels had a hint of sweetness to it and tasted so fresh and paired so well with the cream cheese!!! I had a toasted rainbow bagel with veggie cream cheese, the kiddies had toasted rainbow bagels with sprinkles cream cheese and my sis had a toasted blueberry bagel with lox and cream cheese. All were so yummy!!! The staff was also super friendly! James at the cash register was so pleasant to speak with! I've been coming here for years ever since they had their small store on Ocean Ave and Ave Y many... read moreI've been coming here for years ever since they had their small store on Ocean Ave and Ave Y many years ago. Even though the store expanded, nothing has changed except for longer lines every single day... Especially on the weekend. 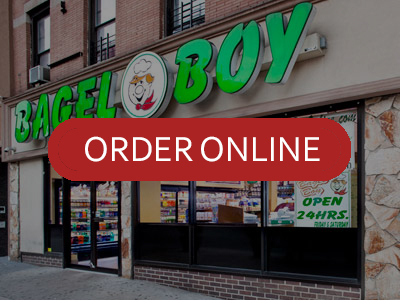 Bagel Boy has amazing bagels, the BEST in Brooklyn and even out of Manhattan! They are always fresh, crispy on the outside, and gooey on the inside. I also really enjoy their low-carb bagels. Woah. Seriously, I don't even know where to start. We got re-routed to JFK instead of BOS (long story) on our... read moreWoah. Seriously, I don't even know where to start. We got re-routed to JFK instead of BOS (long story) on our way to DCA, and we decided it would be cheaper (again, long story...) to rent a car and drive to DC from NY. One of the amazing side benefits of this situation was being able to stop and get my FIRST, real NY bagel. I'm pretty much ruined for bagels going forward from here. So much so, in fact, that I spent about 2 hours researching where to get a "real" NY bagel in CA, and found out that it's just not going to happen. I'll get kinda close (see: The Original Brooklyn Water Bagels and The Bagel Broker), but never like this. Not only did it taste amazing, the texture was unbelievable. Really interesting to experience, and after a few bites, I was hooked. I knew that there was a better way to bagel, and this has got to be it. I got a French Toast bagel with regular cream cheese, and it was awesome; my *only* critique, if anything, was that it could have used a bit more "french toast" flavor. But, I'm guessing that it's something that was intended, and so I appreciated it for what it was. My wife got some sort of other bagel (to be honest, I was so deep in the experience, I don't even remember), but with their Funfetti cream cheese, which was also awesome. They really captured the "funfetti" taste, which is hard to do, sometimes. Bagel Boy - the only boy I can always depend on. I absolutely love this place. Delicious bagels, massive portions, reasonably... read moreBagel Boy - the only boy I can always depend on. Bagel boy in Brooklyn is just as yummy. Miss brooklyn bagels and breakfast' and this place hits the spot. I've finally found a bagel shop that reminds me of New York. Delicious bagels & spreads. I love their veggie... read moreI've finally found a bagel shop that reminds me of New York. Delicious bagels & spreads. I love their veggie cream cheese. They chop fresh radishes into it and it really adds a lovely crunch! The staff is prompt and friendly and their bagels are always perfect. Everything from this place is amazing,my favorite lox w/veg.creamcheese always fresh! Always good, fair pricing and pleasant people. I typically get lox on a bagel and portions are perfect. This place has the BEST bagels/sandwiches, you name it. I remember I used to play hookie when I was attending... read moreThis place has the BEST bagels/sandwiches, you name it. I remember I used to play hookie when I was attending OBHS and always stopped here to eat. all their bagels are excellent, whole wheat everything, garlic, but the pumpernickel in particular stand out for what seems to... read moreall their bagels are excellent, whole wheat everything, garlic, but the pumpernickel in particular stand out for what seems to me to be a hint of perhaps molasses added to the mix (?). the best i've had. do a taste test yourself, as i've done comparing with other bagel shops, and see if you agree. I am a huge bagel fan. The bagel here are the definition of perfection! They're delicious. I will be back!!! We stopped by here before heading to our cruise. Never really noticed it until my bf mentioned it, and I... read moreWe stopped by here before heading to our cruise. Never really noticed it until my bf mentioned it, and I think I'll be going here more often! Bagels were fantastic! I ordered an everything bagel with sausage, egg, and cheese. Omg!.. it was glorious! The bagel had the right amount of 'everything' and there was a slight sweetness in the bagel itself. Best bagels in Southern Brooklyn! They cook them to perfection and have a great list of spreads available as well.... read moreBest bagels in Southern Brooklyn! They cook them to perfection and have a great list of spreads available as well. Bagel Boy is great . 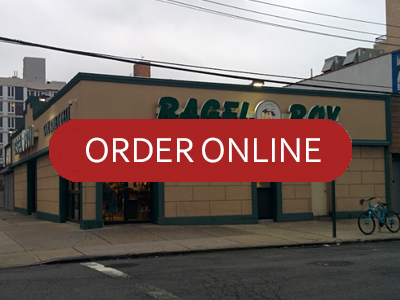 Tasty fresh bagels ,deli sandwiches , cookies and muffins . An assortment of different coffees... read moreBagel Boy is great . Tasty fresh bagels ,deli sandwiches , cookies and muffins . An assortment of different coffees ,teas and drinks. The service is what it should be . They take your order correctly and are friendly and courteous . Hands down one of the best places to get breakfast food from in Jersey!! If you're not from Jersey, we... read moreHands down one of the best places to get breakfast food from in Jersey!! If you're not from Jersey, we take pride and have strong feelings about where we get our bagels from because, to be honest, good bagels make all the difference when you have breakfast. They are a very busy super-deli that make a lot of great food. Their bagels are top ten in the state, if not a little higher. Came here a few weeks ago while my friend from Montreal visited to settle who has the best bagel. We had... read moreCame here a few weeks ago while my friend from Montreal visited to settle who has the best bagel. We had friendly and quick service and ended up getting an everything bagel with regular cream cheese.